← Your Journal needs you! SDFHS member Warwick Kellaway of Hamilton, New Zealand, has been researching his family history for many years. The name Kellaway/Kelleway/Kelloway/Kelway/Callaway/Calloway/Calway/Callow/Kellow, and the other variants seen today, is reasonably considered to derive from the village of Caillouet, in Eure, northern France. The first dated record of the family name in England has been accepted to be that of Philip de Chailewai in the 1165 Gloucester Pipe Rolls holding land in Wiltshire, probably today’s Kellaways. However, Roger de Kaillewi had been recorded in Gloucester in the reign of King Henry I, perhaps about 1120, and his name was also spelled de Cailli. The village of Caillouet is very close to that of Cailli sur Eure, Osbern de Cailli had been an envoy from Duke William to Edward the Confessor before the Conquest, and the family was related to the powerful Beaumont family. By the mid 1300s the head of the family, then named le Calewe, held the Dorset manor of Dunes Weston, thought today to be Stalbridge Weston. In the early 1400s they were prominent in Sherborne, and John Kayleway was present in 1436 when, during a dispute between the monks, and townspeople, the parish priest set the roof of Sherborne Abbey alight. 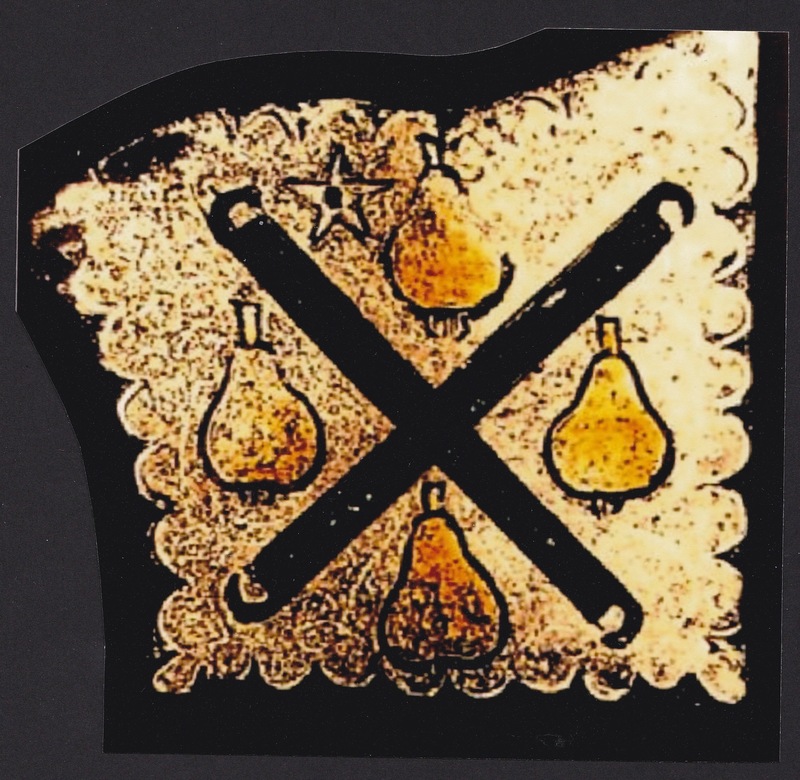 During the 40 years of rebuilding the Abbey the family might have been involved with the provision of new stained glass windows, as glazing grosing irons are seen, with pears, on a small depiction of the family coat of arms in Sherborne Abbey. The coat of arms date from possibly around 1450-1500, or perhaps from the granting of a knighthood to William Keyleway who was created a Knight Commander of the Bath in 1501 upon the wedding of Arthur, Prince of Wales, to Catherine of Aragon. They comprise four pears between crossed glaziers snippers/grosing irons. Combining the craft of stained glass with the Cailou/Kaylewell pear popular from the 1200s. Evidence, which also indicates links with other families, suggests that there could have been earlier family arms, of a chevron and three leopards’ (lions’) faces. These arms are shared by the families of Callow, Kaloway, Kelley, and Weston. Here the star in the arms indicates the 3rd son, who is now considered to have been Thomas Kellaway, born about 1475, whose elder brothers had predeceased him, and was a cousin of Sir William. My own Kellaway family emigrated to New Zealand in 1865 and I would be very pleased to hear from anyone who shares the name (in any of our variant spellings). This entry was posted in Uncategorized and tagged Coat of Arms, Dorset, Family History, Kellaway, SDFHS, Sherborne, Sherborne Abbey, Somerset. Bookmark the permalink. Hi, im kevin Callaway from Utah .how’s it going?